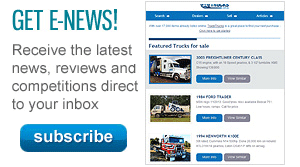 It is probably due to the proliferation of Japanese and European trucks in the Australian market, but apart from some serious brand recognition — that dog really gets around — I haven’t got much experience in Macks. So when Mack hosted its very clever ‘Weapons of Mass Construction’ showcase in late 2009, and then offered to ‘match-make’ with operators running the same equipment, I jumped at the chance. Who would say no to a chance to go play in someone else’s sandpit with some seriously big toys? 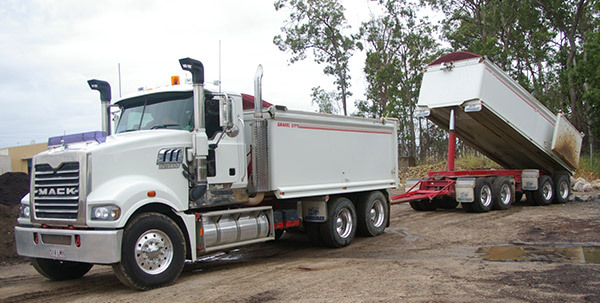 Fast forward to February 2010, and I am motoring north out of Brisbane to spend the day with the team at Gravel City, a combined quarrying and road transport operation, with a retail yard catering to the needs of landscapers and small-scale developers. 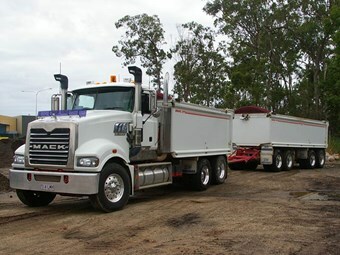 Opening its doors in 1981, over the years Gravel City has grown to be a regular contractor on major infrastructure projects, although with a fleet of 40 company-owned trucks director Peter Turner shies away from being described as ‘one of the big boys’. 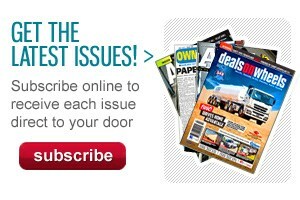 Despite this, Gravel City did manage to deliver 300,000 tonnes of fill in just six weeks when Qantas decided to expand its Brisbane Airport maintenance facility, and another 500,000 tonnes for the Caboolture by-pass roadworks. To pull these jobs off, Gravel City required its full fleet out in force, plus enough subcontractors to put 80 trucks on the road every day. This is no mean feat, especially when it comes to coordinating all of those movements both in and out of the quarry, but also in and out of the construction site. There is no doubt the Trident is a good-looking truck, with its tall grille topped by a stylised ‘M’, so as to leave no doubt over its parentage, flanked by a pair of low-set dual headlights. In construction transport payload is everything, so Mack’s decision to go with a lightweight flip-top front end integrating the bonnet and guards was greeted with cheers all round. Topping the whole lot off is the trademark bulldog, which serves a couple of practical purposes, such as being a hand grip for pulling the bonnet assembly, while it also makes a great way for lining the truck up on the road — just keep the dog’s snout along the white line. What came to be the most appreciated feature of the whole test drive is the side steps, running the full length of the door openings, and plenty wide enough for my size 11s. Even better, there are two of them on each side, so it is easy to climb up into the cab, and they have a cheese-grater surface finish — so the mud just scrapes right off the bottom of the boots. No dirt inside the cab — beautiful. The fuel tanks are huge, probably bigger than is really necessary given the relatively short trips most tippers make, and there is one each side, a strange choice when everything else on the truck is about saving weight, but apparently the drivers love them. The Trident gives off an aura of strength, it just radiates out of the truck. There is just an overwhelming feeling of solidity and strength of purpose, right down to the heavy-duty chassis rails and, in this case, Hendricksen airbag suspension. Another Mack weight-saving measure, which just happens to look good too, are the alloy rims. The decrease in tare weight over 10 rims is more than 150kg. Putting this figure into perspective is Peter Turner’s explanation that for an operator, 500kg of product equates to 1.5 per cent of gross income, so if Mack can cut a few kilos here and there, to operators like Gravel City it makes a big difference. The 780-cubic inch (somehow 12.8-litre doesn’t sound right) six-cylinder engine is the weapon of choice for Gravel City, providing up to 500hp (373kW) for the drivers. More importantly, it is all usable power. Mack use three-stage cooled exhaust gas recirculation to meet environmental regulations, and is proud to say the MP8 has lower soot levels than any other American engine, in Euro 4 trim. 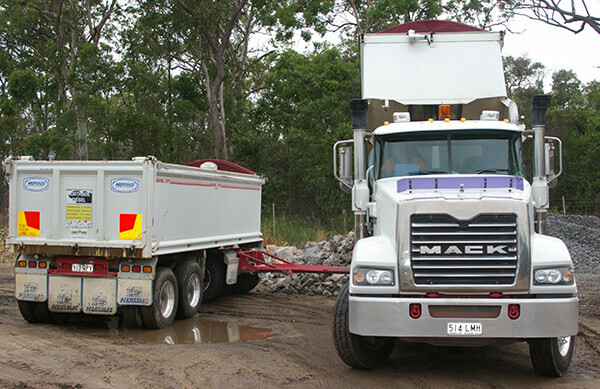 The Mack Trident 6x4 tipper features an 18-speed non-synchro Eaton-Fuller. When the New Breed was launched back at the end of 2007, Mack engineers crowed about a number of improvements, not the least the inclusion of cupholders. All they had to do was relocate the air-conditioning unit into the passenger-side foot well. Aside from that, and bear in mind most tippers run in single-seat configuration, the really big news was the extra 10cm of belly room, achieved by stretching the cab backwards, and pushing the driver’s seat back a bit. While that was appreciated for big and tall drivers, like myself and Gravel City Operations Manager Adam Swindell, it still leaves us too close to the steering wheel to be really comfortable. A little more height on the tilt and reach adjustment would be even better. Sliding onto the air-suspension seat, you are insulated from the worst of the potholes, but not all, and find yourself face-to-face with the most comprehensive instrument panel this side of a Boeing 747. There are gauges everywhere, and for everything, in fact the only one I could not see was the one giving me the temperature of my latte, but I could tell you just about everything else going on around the truck. For me, this kind of instrumentation can be distracting, because you are scanning a dash that looks as big as a quarter-acre backyard, trying to find the gauge that tells you what you need to know. Also, possibly because of my height, I found the speedo and tacho, the big pair in the middle of the steering wheel, angled so far forward that the top of the gauges started to disappear. The good news is the screen for the Co-Driver electronic monitor is right at the top of the dash, and is clear and easy to read, with plenty of data on offer. The windscreen is steeply raked, reducing the amount of extra light and heat it lets in during an Australian summer, a lesson Ford and Holden seemed to have forgotten over the years. While the wide, flat windscreen generally offers a good field of view, I found looking left required a goose-neck movement, with the chrome stack of the air cleaner blocking out oncoming traffic, despite the relatively skinny A-pillars. The door mirrors are well-placed for good vision. There was no problem with tracking the trailer, even through some twisting and turning reversing manoeuvres that left the trailer parallel-parked alongside the cabin, to allow both trailers to be tipped off without unhitching. 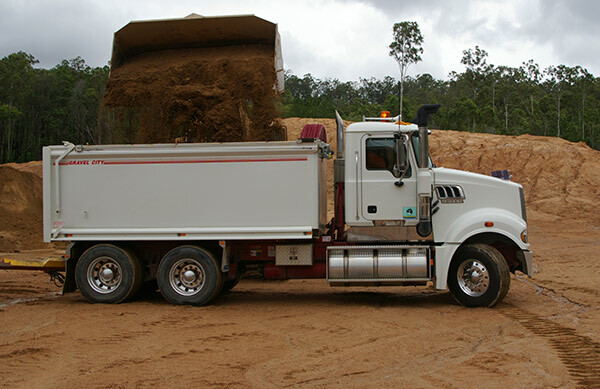 While the ergonomics are not European standard, for example the windscreen-wiper control is a toggle switch in the middle of the left-hand side dash and not easy to find in a hurry, everything is there, just maybe not where you might expect to find it, unless you are an experienced Mack driver. Cabin ventilation is good; while the vents seem small they push out plenty of air, and can be directed to suit individual preferences. Probably my biggest gripe, and this is not limited to Mack — other American trucks use the same system — is the control for the park-brake release. While it might be fine in a normal driving situation, I find having two separate controls, with lockout levers to boot, is counter-intuitive, and they are not easy to get hold of in an emergency. I know there is the large trailer-brake lever for pulling up at traffic lights, but it is on the same side as the gear lever, which means balancing on the foot brake to select first gear, then pulling on the trailer brake and releasing the foot brake. It just feels overly complicated. The gear shift itself was the ubiquitous Eaton-Fuller non-synchro 18-speed manual, otherwise known as the ‘Road Ranger’, with switches for splitting gears and also moving between the bottom and top gearboxes. There is plenty of room on the floor of the cab for storage. We had a couple of extra bags in the cab during our test for cameras and other odds and ends, and the cab never felt cramped at all. I also appreciate the foot room around the big, chunky pedals, although a footrest beside the clutch pedal would be a nice extra. On some of the highway runs to and from jobs you are left with nowhere for the idle foot. The noise insulation is certainly above average. Despite sitting right behind and above the Mack MP8 engine, we were never overwhelmed by noise, even with the engine brake engaged. Overall the cab layout is user friendly, there is plenty of room, and how can you complain about a quarry truck that offers a padded and quilted head lining? No wonder the Gravel City drivers love them. Combined with the six-cylinder engine, the Mack has some well-sorted gear ratios and the end result is a very drivable combination that not only provides good fuel economy, but also ‘lugs’ well in higher gears, reducing the number of times the driver has to shift, which in turn helps extend the clutch life. The Trident’s party trick is taking off through the first four gears without needing any throttle application, even with a decent load in the bin. The shift action is as smooth as you expect with a Road Ranger, and anyone with a background on the US-sourced gearbox will feel right at home. By comparison, the clutch was surprisingly light, and even sitting at the traffic lights with first gear engaged did not prove wearing for the driver’s left leg, while working up and down the gears was no work at all. Despite traversing some pretty rugged terrain on a daily basis, the Trident’s steering is not only light to the touch, without being floaty, but Mack has worked to eliminate many of the ‘dead’ spots that can plague heavy trucks. Instead, while there is a little free play around dead centre, this disappears in the first one-eighth of lock, and the driver is left with a precise feel of what is going on ‘downstairs’, a nice trait when navigating tight quarry roads where too little, or too much, steering can result in an accident. Also impressive are the brakes. 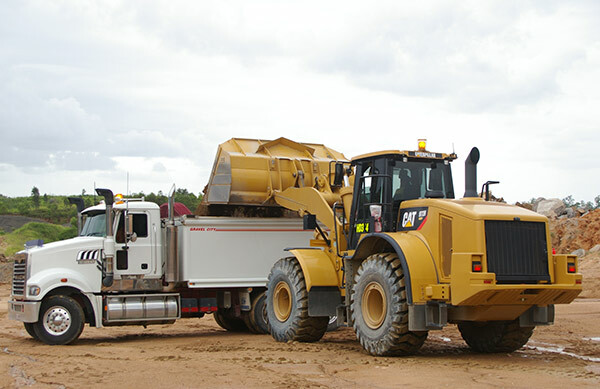 In the case of Gravel City it uses drum brakes for the lower cost of servicing and also they are less prone to contamination from the quarry environment, such as damage from gravel getting caught in disc rotors. The air-brakes are responsive, without excessive bite that can cause rather dramatic brake lock-ups, and when used in conjunction with the Mack ‘Power Leash’ multi-stage engine brake, provide effective stopping power whether loaded or empty. While it might be riding on Hendricksen airbags, the Trident’s suspension is set up on the stiff side of firm, which means you will know about every bump and pothole in the road. There is never a risk of being thrown off course, but the ride can still be jarring. However, this is part and parcel of quarry work, and the Isri air-seat means you are not likely to lose a filling, even on the worst piece of road. So here we go — yes, I prefer the smoother ride and ergonomics of European trucks, but the Mack Trident was a pleasant surprise. It was roomy, quiet, matched the gearing to the torque curve in a way I have not experienced in recent times, has absolutely no flat spots, just seamless acceleration, and boasts the ability to pull itself up a hill with minimal gearshifts, all while hauling maximum payload. Yes, there are a few quibbles, like the forward tilt on the speedo and tacho, and the toggle switches where I would prefer a column-mounted stalk for ease of use, but overall, if you are a dirt pusher then the Mack Trident should be on your shopping list.